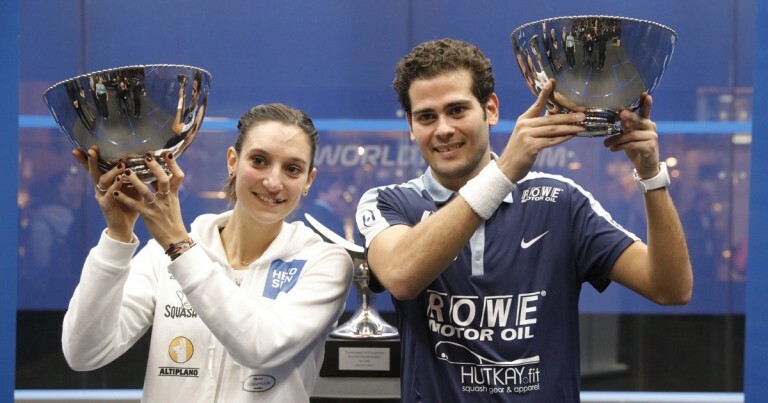 New names were etched into the record books of both the Men’s and Women’s J.P. Morgan Tournament of Champions today (Jan 19) as Egypt’s Karim Abdel Gawad, World No.2, and France’s Camille Serme, World No.4, were crowned 2017 champions on an electric night inside New York’s Grand Central Terminal. The pair, both competing in the PSA World Series tournament title decider for the first time in their careers, prevailed in thrilling encounters with Gregory Gaultier and Laura Massaro, respectively, to take the spoils and add their names to an illustrious list of past winners. 25-year-old Gawad came from behind against World No.3 Gaultier to win 6-11, 11-6, 12-10, 11-6, extending his unbeaten streak to 16 matches to win a third consecutive major title – adding to the Qatar Classic and World Championship titles he won last November. “It’s been an amazing week. I’m over the moon. To win three big titles like the World Championship and Qatar Classic is a great feeling and I have to thank my coaches for the support and hard work that has been put in for the past few years. Serme meanwhile proved that she truly is the player to beat at present on the Women’s Tour by downing No.2 Nouran Gohar, No.1 Nour El Sherbini and No.5 Massaro to add the ToC title to the U.S. Open crown she won last October. The 27-year-old French World No.4 started strong against Massaro, taking a tie-break opening game 13-11, but faded fast as the Englishwoman’s will and determination came to the fore. But at 2-2 Serme responded impressively, stepping up the court to get the better of Massaro and run out an 13-11, 8-11, 4-11, 11-3, 11-7 winner. “I can’t believe I managed to come back today. It was such a big match for both of us. I had to fight myself, because I felt tired and flat, but I could see she was as well. We didn’t play our best – we were both tired and nervous. ‘But after third game my coaches tried to wake me up, they said the right things and they told me to try and play like I did at the US Open so I went out there in the fourth like I was going into a boxing ring. I just had to fight and fight for it.